A Big Hello from Team TGIF Bazaars to you in our first update for 2016. Quite frankly, we have been overwhelmed by our overtures in our bazaar business in the past 2 months and apologize for the lack of activity on our website and facebook pages. Thank you for your patience and understanding as we continue our foray into the bazaar industry. Ok, here's the first piece of good news to kickstart the year! For the first time, we will be operating the Chinese New Year Bazaar at level 1 Atrium at OneKM. Yes- indoor! Booking is open now! On top of the usual offerings (handicrafts, accessories, souvenirs etc. ), festive themed products such as clothing, decorative items, prepacked food are all welcome! Kindly email your queries to eunice@tgifbazaars.com to seek clearance to join us! Alternatively, just click on our 'OneKM Mall Bazaar' page to place your booking now! This is the 3rd year we are there! And our Countdown Bazaar has expanded ! For more information click on the booking link below. Highlights : Fireworks display, Countdown, Festive ambiance. Please scroll downwards to fill up online booking form. 1. Allocation of Booths will be based on first-confirmed-first-get basis, starting from Booth 1 to 52. 2. Once we receive your online booking, we will email you a quotation. -> Please note that the booth quoted to you at this time is not confirmed. 3. Your booking will only be secured after full payment is received promptly within 24 hours from the time booking is made. 4. Official receipts will be issued for all payments made. 1. As the event is one off, we will not entertain any change of date, nor provide any refund if you wish to cancel your booking. You are however, allowed get someone to take over the booth on a personal arrangement. The person taking over your booth must present the same receipt that was issued by us to you. You must inform us if there is such an arrangement so that we can take note of this. 2. No refund is allowed in the event of NO SHOW. 1. The event is slated to continue, rain or shine. 2. No refund will be given for bad weather. 1. Vendors are allowed to unload their merchandise at the open carpark behind Marina Bay City Gallery. You are advised to bring along your own trolleys. 2. You are advised to come early to avoid possible traffic congestion. 3. Parking charges are payable according to carpark operator rates (Wilson parking). Parking is also available at Marina Bay Financial Centre (MBFC). 4. Any illegal parking will be subject to wheel-clamp and a penalty fine imposed by the authorities. 1. You are liable to indemnify the Organiser or URA for any loss or caused to their property and / or injury to their employees arising out of your (including your employees, agents or representatives) negligence. 2. Any littering or illegal disposal of waste is strictly prohibited and offenders are liable to pay a fine or face ban from future participation at the bazaar. 31st December is upon us! We are so looking forward to offering you guys a fun-filled, bazaar at the Marina Bay Promenade as our nation marks the end of 2015 and welcomes 2016 in spectacular and glitzy fashion! On new year's day, we will be operating at OneKM Mall as well as the weekend. Don't forget we will be at Sentosa Boardwalk as well this weekend! Click on venue pages respectively to find out more details. Let's end the year on a high and mark the new with a bang! We are operating on Christmas Day at Sentosa Boardwalk ! and make your booking now! So come celebrate Xmas with TGIF Bazaars on the Sentosa Boardwalk! We apologize for our delayed replies of late! We are packed back to back! Rest assured we will respond to your queries in due course. In the meantime, bookings are still available for our venues in December till March. Kindly submit your bookings via our venue pages on the left and we will get back to you as soon as possible. Due to circumstances beyond our control, we regret to announce that the Marina Waterfront Do Good, Feel Good Bazaar for Nov - 20th and 21st has been cancelled. ​We will be reaching out to organisations and merchants who have signed up individually to provide refunds and alternatives. We apologise for all the inconveniences caused. We are pleased to inform you that brand new editions of the Clarke Quay Bazaar for December 2015 and Jan 2016 are now available for booking! Tuesdays to Saturdays 5pm to 12midnight or later except Saturday, where we will strictly stop at midnight. 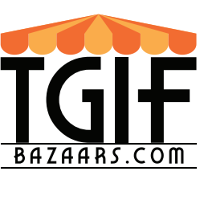 ​TGIF Bazaars goes into organising food kiosks! 'The Future of Us’ https://www.facebook.com/thefutureofus.sg exhibition is an immersive and multi-sensory experience that offers Singaporeans a glimpse of how life in Singapore could be like in the future. This complimentary entry exhibition will run from 1 December 2015 to 8 2016. TGIF Bazaars is honored to be appointed the official organiser for food/snacks kiosks for the Singapore Future Exhibition. Expected crowd : 800,000 throughout, average 8000 per day, mostly locals excluding the existing organic crowd. Sink with PUB water and sewage. Merchants are free to bring in their own equipment such as chillers, food warmers, microwave ovens etc provided they do not exceed the power availability. 1. No beverages or ice-cream (quota taken) . 2. Power availability capped at per kiosk. 3. No open flame cooking, no heavy cooking. 4. If food handling is required, they must hold valid licenses. 5. If pre-packed food is sold, proof that these are produced in NEA approved premises are required. We will follow up by emailing you a sales kit. Whatsapp is preferred over calling as this will allow us to better track your responses, but EMAIL is best. Great news! We will be operating twice a month at OneKM with effect from January 2016! Booking dates are now available! Please click on our venue page on the left to make your booking now! Also, come Nov 30 to 6 Dec, we will be marking our return to Yew Tee Point level 1 Atrium with a Xmas Bazaar! Preferred merchandise - Xmas Themed products. Gifts, toys, decorative items. Children's products. Only original products allowed. Send in your enquiries to sales@tgifbazaars.com now. Very limited booths only. Oh by the way, don't forget we will be operating our bazaar at MBSC 2016, the biggest celebration event of the year! Kindly place your booking on the left to book your booth! TGIF Bazaars is celebrating 2016 @ OneKM with a New Year Bazaar! Brand new offerings await! Watch this space! We are pleased to share we have been invited to operate at the same stretch of passage (from Taxi Stand along River Valley Road towards Fountain Square). Operating hours on both days are 5pm to 11.30pm (You may operate late into the night on Friday only) and rental fee is $180. Clothes. Strictly no clothe racks will be allowed for this edition of our bazaar. Please feel free to drop us a query if you are not sure if your product suits the criteria. Click on http://www.tgifbazaars.com/tgif-bazaars--clarke-quay.html to reserve your booth now! We look forward to seeing you at our bazaars! Dear all, Psi is rising at a rapid rate and is still under observation. Our heart goes out to all vendors and their families: please drink more water, take good care of yourselves. Please get yourself an N95 mask or invest in an Air purifier at home. To all our participating HometeamNS vendors: Please note that we are in the midst of confirming with Hometeam if the event still continues. Bear with us and we will get back to you by tonight. Thank you for understanding. Last but not least, Selamat Hari Raya to all our Muslim friends and vendors. Please be informed that the following programs will cease on 31st July 2015. Merchants who have existing points accrued from our rewards program may top up to redeem all points before 31st August. Please be reminded that the reward points are non-transferable. Click on the link on the left to make your booking now! We have new configurations for our flea market at CSC Changi ! In addition to our gazebo tents, tables-only booths are now available! Each booth comes with 1 unit of 2' by 4' tables with table cloths and 1 chair. For food vendors please bring an overlay to place over our table cloths. Please note that all food must be pre-packed and prepared in NEA-approved premises. Merchants who sign up for both days on 27 - 28 Jun edition qualify for a lucky draw for 5 free booths on 11- 12 Jul ! Book your booth now ! Limited booths available! New slots available for booking for TGIF Bazaars @ Clarke Quay right up to August! We're doing a couple of Weds and Thurs because of special events happening there. New slots available for booking right up to August! To book now, visit click on the link on the left! Come like our new facebook page for Clarke Quay Bazaar to stay updated of events! TGIF Bazaars @ HometeamNS Sembawang is now reopen for bookings! Just click on the link ! The estimated number of visitors is targeted at 5,000 over 2 days. The media will be invited to witness the re-launch of the clubhouse, after a 4 month renovation closure of its facilities to better meet the ever-changing lifestyle experience of the its guests and customers. The event will be aligned with SG50 celebrations, HomeTeamNS 10th Year anniversary celebrations and the showcase of the new debit card tie-up between HomeTeamNS – PAssion – POSB Bank. Attention all VWOs, please note that 17 - 18 Jul 2015 is fully taken up and no more complementary booths are available. We will update your booking status periodically. Dear merchants, TGIF Bazaars is pleased to announce a very special offer for the this coming looooonng weekend Vesak Day, Monday at the Sentosa Boardwalk Bazaar ! All booths will cost only $50 for that day! Each booth comes with 1 table and 1 chair, add-ons available separately. For merchants who are participating on 30 and 31 may, they will enjoy 1 table and 1 chair FREE ! Hurry! This is an offer not to be missed! Remember, admission to Sentosa (Official) is FREE of charge by the boardwalk! If your brand has grown with Singapore in the past 3 to 15 years at least, and are poised to grow in Singapore, with Singapore, or out of Singapore in the next few years - we would love to speak with you for a marketing opportunity that will give you the reachout and potentially touch and sell to 20% of Singapore's population! Please email : kimteck@tgifbazaars.com with your contact details, and corporate profile. Other businesses who wish to leverage this may also enquire. Your enquiry will be treated with confidence. 23 May 2015 - Layout has been uploaded ! FREE BOOTHS* by TGIF Bazaars ! * Attention all ‪#‎VWOS‬ and your affiliated Social Enterprises !registered with NCSS Singapore ! (See link below), we are sponsoring 10 booths for each edition for the 6 months we are back at the Marina Bay Waterfront Promenade at the Marina Bay Singapore ! Find out how you can get these booths for FREE ! Email: kimteck@tgifbazaars.com to find out more! TGIF Bazaars is pleased to announce our return to OneKM in June, July and beyond! Due to popular demand, TGIF Bazaars is pleased to announce we will be operating at Clarke Quay again on 8-9, 15-16 May, 12-13, 26-27 June (Fri & Sat)! Venue: Near Central Fountain, Sheltered space outside the defunct Aqua Nova and Playhouse. Please click here to place your booking now! Limited booths only! TGIF Bazaars will be back at OneKM on 1st - 3rd May, from 12pm to 10pm daily. On top of our usual weekly bazaar at Sentosa Boardwalk, we will also be operating on 1st May (Labour Day) at the Sentosa Boardwalk as well from 4pm to 11pm. Do not miss these opportunities as there will be anticipated higher volume of human traffic on Labour Day at both our venues! Hot news! - TGIF Bazaars will be operating on 10-11 & 17-18 April at Clarke Quay (Next to Fountain Square). Booking is available now. Click here for more details! We would like to make another urgent announcement that our weekend bazaar on 28-29 March, Flea & Easy at Chinatown Singapore has been cancelled as a mark of respect for our national loss. We would like to make an urgent announcement that our weekend bazaar at Sentosa Boardwalk on 28 to 29 March is to be cancelled, as a sign of respect, and heed from authorities to tone down any celebratory activities in mourning of the passing of our great Founding Father, Mr Lee Kuan Yew. All affected vendors will be contacted individually in our next course of action, and will be given the option to either choose replacement dates, or get refunded on their booking made for this weekend. We wish to apologize for any inconvenience caused to you. Our Flea & Easy at Chinatown (28 & 29 march) shall still proceed as planned. As a mark of respect for the nation's loss, TGIF Bazaars is suspending our SG50 promotions at the Sentosa Boardwalk Bazaar. However, as we have already opened our dates for bookings up to 31st May, we will still accept reservations for SG$50 weekend promotion till 31st May. Thus the SG50 promotion will be suspended from 1 Jun onwards, until further notice. Great news! Kindly note that the month end edition of TGIF Bazaars x 1KM has been postponed to the first weekend of May (1st May (Labour Day) to 3rd May). All vendors who have booked 27-29 March will be notified duly and shall have priority over the booths they have booked. Pen this down on your vendor calendars! Our daily operating hours for 1st to 3rd May shall be from *12pm to 10pm! Interested parties may email us at enquiry@tgifbazaars.com. Hurry! Limited Booths only! Response to our SG50 promotion is overwhelming. In our bid to improve on work efficiency (we know it's difficult to find staff these days), all booths for SG50 promotion will only be allocated by the organizer on the day of the bazaar itself. All vendors are to approach the organizer booth to make enquiry for their respective allocated booths. This new measure will immediate effect from February 2015 onwards. Give us some breathing space lah! TGIF wishes all our friends a belated happy 2015! We apologize for the delay in updating our bulletin board as we have been very tied down with negotiations for new venues in the upcoming months of 2015! Hot news #1 - TGIF Bazaars will be organizing 3 edition bazaar at the main entrance of OneKM Mall come every last weekend of January, February and March 2015! Click here for more details! 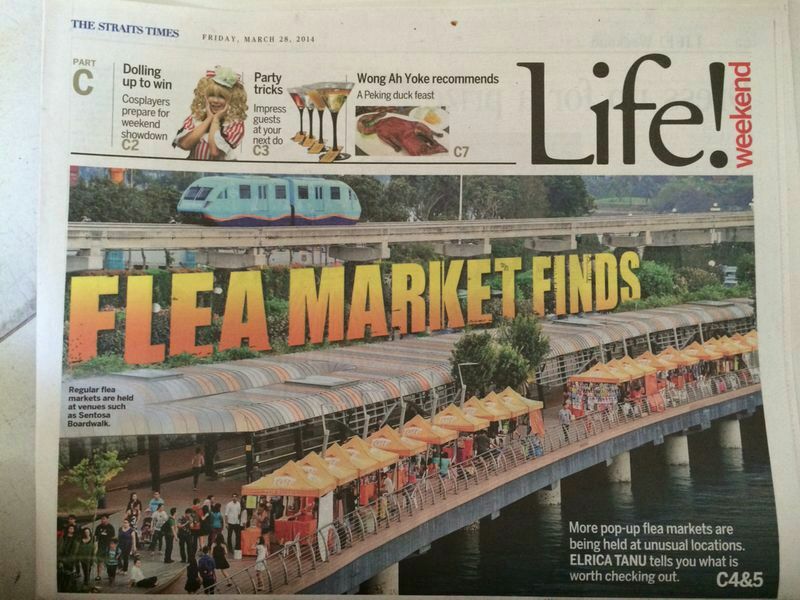 Hot news #2 - TGIF Bazaars is pleased to announce we will be operating the Flea & Easy Chinatown at Pagoda Street on the last weekends of February and March 2015! Booking is open now! Excited yet? Keep a lookout for more announcements as the TGIF Bazaars Team will be looking to add new offerings and venues to our bazaars in the near future! Our entire team is on-site preparing for the Marina Bay Singapore Countdown 2015 Bazaar #MBSC2015, our responses will be slow - please bear with us. The Team from TGIF Bazaars wishes one and all a Merry Christmas and a Happy New Year! There are only 3 or 4 more booths left for the Marina Waterfront Bazaar @ Marina Bay Singapore Countdown 2015 ! Please hurry and book if you want to secure your booth! We have also launched our long over-due blog, at http://bazaarsinsingapore.blogspot.com, where you can get informational information. 05/12/2014 - Superb Living will be back this weekend with ladies from the Business women network back for their last market for the year Dec 6-7th. See you there. 21/11/2014 - TGIF Bazaars is pleased to celebrate Singapore's 50th birthday and we would like to share the joy of our celebration with everyone! Beginning December 2014 and for the whole of 2015, you can book a booth for an entire weekend at just $50*, only at the Sentosa Boardwalk Bazaar. So lets celebrate SG50 together! 19/10/2014 - One of the biggest event on our national calendar is within our sights. Come 31 December, TGIF Bazaars will be celebrating the Countdown 2015 with everyone at the Marina Bay WaterFront! Expect a crowd of 50,000 and more at the bazaar as our nation says goodbye to 2014 and welcome 2015 in glitzy and spectacular style! Booking is available now! 19/10/2014 - TGIF Bazaar is ending 2014 with a bang with more venues and offerings for our friends! From 15 to 31 December, we will be operating the Paris Christmas Bazaar at Yew Tee Point from 11am to 9.30pm daily! That's right, we are going indoors again! Booking is available now! Click here to book your booth! Limited booths only! 28/09/2014 - Scary Deal for Sentosa Boardwalk Bazaar in October! Click here for more details! 18/09/2014 - Flea & Easy Chinatown has been postponed until further notice. All affected vendors will be contacted individually. We apologize for the inconveniences caused. 7/9/2014 - Just in -> The Marina WaterFront Bazaar will be held on the last weekend of November, 29-30 as well! Do not miss it as well! Book now avoid disappointment! 27/08/2014 - The Marina WaterFront Bazaar is back at the Marina Bay Promenade in October and December! Booking is available now! Book now to secure your booths as the festive season is just around the corner! 25/08/2014 - We are pleased to announce that we have a new bazaar happening in Chinatown, Flea & Easy ChinaTown! Click here to find out more! Come visit us the Sentosa Boardwalk Bazaar and Marina WaterFront Bazaar this weekend (26-27 July). The Marina WaterFront Bazaar is back! We will be operating on 28-29 June, as well as 26-27 July! Limited booths only! Booking is open now! Attention Fans of Sentosa Boardwalk Bazaar! We are pleased to announce that come June 2014, we will be operating every Saturday & Sunday (except otherwise stated) at the Sentosa Boardwalk! Please click here (scroll downwards) to see our new price packages, revised to provide you with greater value and savings! Our first indoor bazaar at Zhongshan Mall on 31st May to 1st June 2014 is is available for booking now! Due to circumstances beyond our control, The Duke's Bazaar and TGIF Bazaars have decided to postpone Boot Loot indefinitely. Affected vendors will be notified by us separately. Stay tuned with us for our other bazaars! We will be operating the Sentosa Boardwalk Bazaar during the Easter Weekend from 19-20 April! Double your rewards points when you participate during the Easter Weekend! Terms & Conditions apply! On 20 April, our operating hours will be from 12pm to 8.30pm. Please take note. The Zhongshan Park Easter Bazaar, taking place from 19 to 20 April is available for booking! We have a lineup of events happening to ensure it will be a fun-filled day with lots to offer for everyone! Happening every Sunday in April & May! Boot Loot @ TOC (Top Of ChinaTown) is available for booking! IMPORTANT ANNOUNCEMENT ! GOOD NEWS ! TGIF Bazaars celebrates our first year anniversary at the Sentosa Boardwalk Bazaar and we are pleased to announce a MEGA DISCOUNT ! Believe it or not, you can book an outdoor bazaar booth from ONLY $40 onwards ! *T&C applies. Since our inception at the Boardwalk on June 2013, footprint of shoppers at the Sentosa Boardwalk Bazaar has increased from an average of 7,000 to 9,000 up to 12,000 on good Saturdays! ! We could not have done this without the support of our vendors, so we're celebrating this by offering everyone our anniversary discount! We sincerely thank all our friends and fellow business partners in making TGIF Bazaars the most visible outdoor bazaar in Singapore. We look forward to seeing you at our bazaar soon! *GOOD NEWS* - We are pleased to announce that due to the emergence of a private sponsorship received for Marina WaterFront Bazaar during the iLight 2014 festival, we will be revising our rental rates as well as making some changes to our package for iLight 2014 with immediate effect. All prices are nett and includes a 2.5m x 2.5m tent, 2 x (4ft by 2ft) tables w/table cloth, and 2 plastic chairs. Lighting is provided within the tent. Power points will be provided FOC! Check out the i Light 2014 Festival! Booking for Marina WaterFront Bazaar is open! We will be taking a break this coming weekend (1st & 2nd February) to celebrate the Lunar Horse Year. We like to take this opportunity to wish all of you entrepreneuers & shoppers out there a Prosperous Horse Year! Stay tuned for more exciting announcements from us in the coming days! Our January to May 14 dates are now available for booking -> click here! Happy 2014 from the Team from TGIF Bazaars! TGIF Bazaars is pleased to announce we have been appointed by URA to operate the Marina WaterFront Bazaar on the last weekend (Saturday & Sunday) of the month, starting October 2013. Sign up for a booth @ THE SENTOSA BOARDWALK BAZAAR & kickstart your retail entrepreneur career! TGIF Bazaars is the appointed operator of the inaugural Sentosa Boardwalk Bazaar, which started on 1st June 2013. The Sentosa Boardwalk Bazaar operates on every Saturday, from 4.00pm to 11.30pm.